An artist's conception of a lake on Titan. Cyclones could form above the Saturn's moon seas if they are mostly made of methane, new research indicates. Titan, an ocean-covered moon around Saturn that's usually so cold methane falls as rain, actually warms up enough in the summertime for high-speed cyclones to whip across its seas, according to new research. Sea evaporation could create enough energy to produce winds as high as 44 miles per hour (70 km/h) on Titan, which is the largest of Saturn's dozens of moons. But whether cyclones form at all depends very much on what Titan's seas are made of. If more than half of an ocean is composed of methane, the chemical recipe would be perfect for a storm. "In the next few years, we will approach summer in the [northern] polar region and we might have the chance to see a cyclone, if the condition is favorable," said Tetsuya Tokano, a researcher with the Institute for Geophysics and Meteorology at the University of Cologne. Tokano's research is appearing in the April 2013 issue of the journal Icarus. Kraken Mare, a large lake filled with liquid hydrocarbons, in this Titan image from the Cassini spacecraft. Cyclones could form above seas such as this if they are mostly made of methane, according to new research. Cyclones could form above the Saturn's moon seas if they are mostly made of methane, new research indicates. Cyclones on Earth happen principally in two ways. The first, which cannot happen on Titan because the temperature range is too small, occurs when cold fronts and warm fronts run into each other. Warm and cold air bend around each other and generate high-speed winds. The second happens when heat from Earth's water warms the air and makes it rise, creating an energy cycle that produces high-speed winds. As the cycle continues, it fuels a spinning storm. This is what could happen on Titan. Such winds could occur on Titan only above its mid-latitude seas, where there is the right combination of moisture and temperature to create the rising air. Tokano said the difficulty is that we don't yet know the exact chemical composition of Titan's seas. "There is big uncertainty, and many possible types of hydrocarbons," he said. However, if the seas are mostly methane, they could transfer enough energy from the surface of the sea into the atmosphere to create cyclones. Methane is the only liquid on Titan that can condense like water vapor on Earth. "This potentially would be large enough to make a cyclone in favorable conditions," Tokano said. Cassini hasn't spotted any cyclones on Titan yet because it's been too cold in the north. 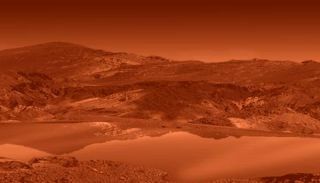 (The average surface temperature on Titan is minus 289 degrees Fahrenheit, or minus 178 degrees Celsius). Summer won't arrive on the moon until 2015, but Cassini should have at least two years of observations after that before ceasing operations. The cyclone's signature would be obvious and would be "no problem to detect," Tokano said. If cyclones occur, there would be a huge energy transfer along with a storm size of at least 62 miles (100 kilometers), he predicted, making it easy to spot by the spacecraft. Cassini already has imaged cyclones on Saturn. At Cassini's resolution, the spacecraft wouldn't necessarily need to be close by Titan to see a feature as large as a cyclone, he said. There are several close flybys of Titan scheduled between 2015 and 2017 as well. While it's difficult to predict what an observed cyclone would teach us, Tokano said it would fundamentally show changes in temperature in the northern hemisphere between winter and summer. "This would indicate Titan’s weather has similarities with Earth," Tokano added.